Shooting the ISS by day - mission impossible? As the title suggests, I'll give this a shot if it's possible otherwise I won't as there are inherent risks. 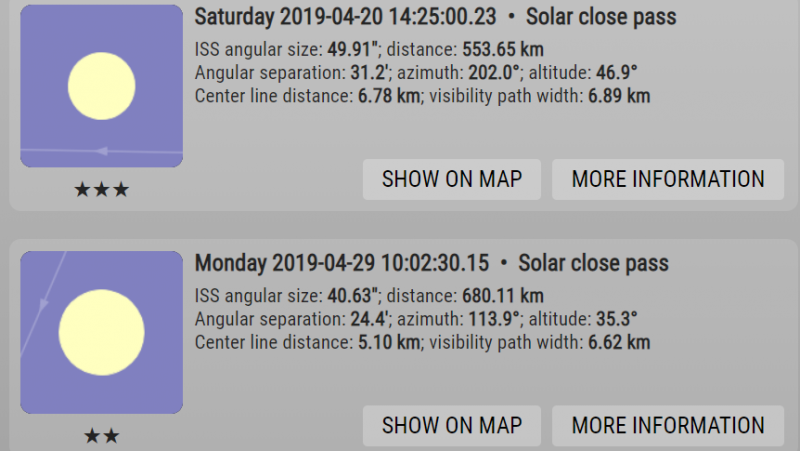 There are 2 near-miss ISS solar transits coming up, one is a sun diameter from the sun and the other is even closer. The risks aside, would there be enough contrast against a blue sky (now that's wishful thinking) to detect the ISS at all? Or is there a filter that would help? Any advice would be greatly appreciated. So would any reprimands, scorn, hilarity or bad puns (you know who you are). Not too sure your going to "see" anything with the illuminating source next to and REALLY far behind it. I guess you could get lucky and catch a glint from an array or flat surface. Edit: Oh, I see what you're trying to do. If you're trying to capture the ISS flying past the sun (not transiting) I don't think that's possible. The sun is behind it, nothing would be lighting it up from our perspective. Definitely an interesting idea though, maybe someone else has attempted this in the past and can say if it works or not. Edited by RyanSem, 17 April 2019 - 07:08 AM. I was thinking that I was able to image... kind of... the ISS passing by the sun by using my 60mm Lunt... I have a very tiny 'sunspot' that was not there, then appeared in 1 frame, then in a different location on another frame, then gone. Not the proverbial snowball's chance in Hell, Kev. Sorry. Given the ISS-sun-observer angle of close to zero, it will not be illuminated. Anything which you would expect to be perceived as "darker" than the clearest blue sky will be invisible. The scattered light in the atmosphere is between us and the ISS. Edited by RedLionNJ, 17 April 2019 - 04:52 PM. Kevin, not only would this not work because the ISS is completely overpowered by the Sun, but it would be dangerous to try (at least for your equipment). Anything under 10 degrees separation from the Sun (about 20 solar diameters) is a real challenge to image, because of light flaring and reflecting off the interior surfaces of your scope. But you do see images of Mercury taken from about 5 degrees or so (sometimes slightly less) separation from the Sun. Your diagram above shows a separation of less than 0.5 degrees, which I don't think many would be comfortable trying without a solar filter. And even if you did manage to avoid frying your camera, the flare that makes it to the sensor would be overwhelming. Even a brightly illuminated object would be invisible. Edited by Tom Glenn, 17 April 2019 - 04:49 PM. Also, at the risk of overstating the obvious, instead of trying something heroic, why don't you move your scope by a few hundred meters so you are in the path of the transit? Based upon those diagrams, it would probably only be a few kilometers or less for you to be in the path. Edited by Tom Glenn, 17 April 2019 - 11:58 AM. I think that this would be doable but not with it close to the Sun as you propose, but in the opposite part of the sky and close to (transiting) something bright like Jupiter or Venus that you can find during the day. Point at Jupiter and wait. You could increase the contrast between the sky and the ISS by recording in IR. Just to clarify, capturing the ISS by day is totally possible, and has been done many times. So in that sense the answer to Kevin's title of the post is yes, but not under the circumstances he is depicting here. When farther from the Sun, the ISS is illuminated, and although you wouldn't notice it by naked eye during the daylight sky (unless near sunrise or sunset), it is actually brighter than the background sky and could be imaged through a scope, similar to Venus and Mercury during the day (Jupiter and Saturn can also be done during the day). But when it is less than 0.5 degrees from the Sun, it will be technically impossible to capture. This would be similar to imaging the New Moon, which has been done by at least one person (Thierry Legault), but when Thierry imaged the New Moon it was at a near maximum distance from the ecliptic plane, and so he had about a 5 degree separation from the Sun. This still required the construction of a sun shade to block stray light from entering the scope, but it was possible. Edited by Tom Glenn, 17 April 2019 - 04:42 PM.